You want paleo pancakes? You got paleo pancakes! And I’m not talking about the sissy, wussy paleo “pancakes” that imitate the regular sweet, wheat pancakes to be enjoyed with jam and chocolate. No! Forget about the mushed bananas and coconut milk and gluten free grains. Ditch the honey and maple syrup how ever organic they may be. These pancakes are made of actual beef liver! You heard me. LIVER PANCAKES! I know, it’s a tad provocative to call these pancakes. Nevertheless, I think they resemble pancakes and therefore I shall call them that. Or patties? 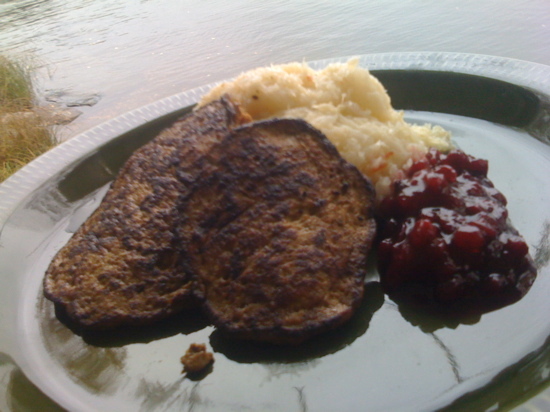 Patties or pancakes, these crepés made out of ground liver are a traditional Finnish food. I always loathed these in school, I couldn’t stand the taste of liver. Still it’s hard for me to eat just plain liver and I don’t really do that even if I wanted to. But these are more subtle in their livery taste and oh so tasty! I’m proud to present, organic beef liver patties! Grind the beef liver into fine “puré” (we used the finest blade in the meat grinder, the more coarse one would prolly have done as well). Grate the carrots and the onion, mix into liver. Add the egg and season with salt and some dried herbs. I hear marjoram and rosemary are very typical when spicing up liver but since we didn’t have neither I chose estragon. Worked. Bake the liver patties on a large pan in a generous amount of butter, some three or four little patties at a time. Swap over when they’re settled and fry the other side. Eat with plenty of mushed cauliflower and lingonberries. Superb. And there are any left after your liver feast, believe me, the taste just intensifies after a night in fridge… Boy I turned from liver hater to a lover. Lov-errr <3 A big thank you for the Metsäojan tila who provided the quality liver (and 15 kilos of beef). all in a brief billet designed to show off your personality.